The first application of paint! This is such a blast! I use a large, soft bristled brush to gently float water over the entire canvas. Have lots of paper toweling on hand as this gets very drippy and messy. I use three colors that relate to the primary colors: New Gamboge, Quinacridone Magenta, and French Ultramarine Blue. These are just my go-to colors. They seem to work so well and blend nicely. I dribble the wet pigment into the water on the canvas, and allow it to flow and blend. Don't tip the canvas too much or you will create a solid color or just mud. Notice that I apply the colors somewhat carefully, adding the blues to where I will develop darker values and lighter, wetter, warmer dribbles into areas that need to remain lighter. Allow this to dry thoroughly. Then apply masking to the next darker value (value number two). Just remember that the masking saves the lighter areas. Your whites are already saved, now save the next darker color. Do the same for each application until you get to the darkest darks. Apply the next layer of paint in the same manner as the first, but use stronger pigment with each application. You can also switch to a different color trio if you like. 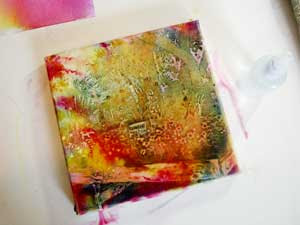 I use a small spritzer to control the wetness and flow of the colors. I can also use it to "wash" off color that is too dark or the wrong color. To blend the pigment use a very light spritz, to wash color use a more forceful direct spray. Be sure to allow the color to drip over the sides of the canvas. 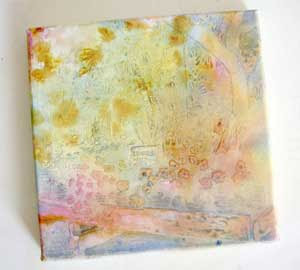 I love to work on gallery wrapped canvas because the pigment flows onto the sides and creates lovely patterns. I don't have to frame it when I'm done, either! Debbie, your explanation is great, and the process looks like so much FUN!